Earlier in the month, Steve Streufert of Willow Creek's Bigfoot Books posted part one of three of his interview with Al Hodgson. 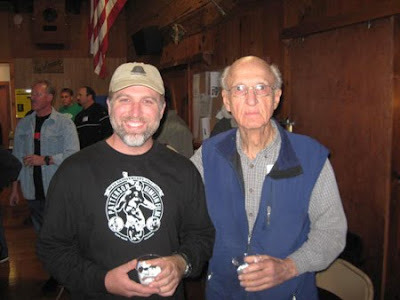 If you don't know who Al Hodgson is, you haven't read about the early days of bigfooting. He was the first phone call after the Patterson/Gimlin Film was obtained. He was a cohort of Betty Allen, one of the earliest bigfooters in the United States. He is an old-timer patriarch of Willow Creek, arguably the bigfoot capitol of the world. He was there. He saw bigfoot history happen. Steve sat down with Mr. Hodgson for an extensive interview and is now busy transcribing it in its entirety. I blogged about part 1 last week, and now part 2 has been published. If you're a bigfoot nerd like me, or even kind of like me, you should probably read the interview. It is full of tidbits that have been left out of the bigfoot literature. For me, it's a fascinating glimpse into the past when the [human] giants of Bigfootland were still fumbling their way through the dark of an uncharted science. The value of these types of interviews cannot be overstated. That generation of bigfooters is slowly disappearing to the squatching netherworld, and time is limited to pick their brains on what actually happened back in the day. Read part two of Steve's interview here.